I'm pretty spoiled. Since my husband works only a 5 minute walk from our home and generally works much shorter hours than I do, he has taken it upon himself to be the food provider of the household. He does all of the groceries and cooking. Most nights I get to come home to a home-cooked meal that is ready as soon as I walk in the door. Unfortunately for me, my husband is away on a business trip again this week. I usually scrounge for leftovers in the fridge or eat take-out in his absence. However, after 2 weeks of husband absentia things are getting desperate in the fridge and I can't handle the prospect of another night of fast food. Long story short. I cooked last night. It's probably one of the first times I've made dinner in the last 5 and a half years (which is funny since I used to work in a kitchen and am a prolific baker). One thing I can say for certain is that cooking is nothing like riding the proverbial bicycle. Skills get rusty. In addition to having no idea where to find various kitchen implements, your brain needs to really work to get things done. Like yesterday, I caught myself with a pot full of uncooked pasta and not a drop of water in sight. Embarrassing yes, but fortunately the dog was the only witness. 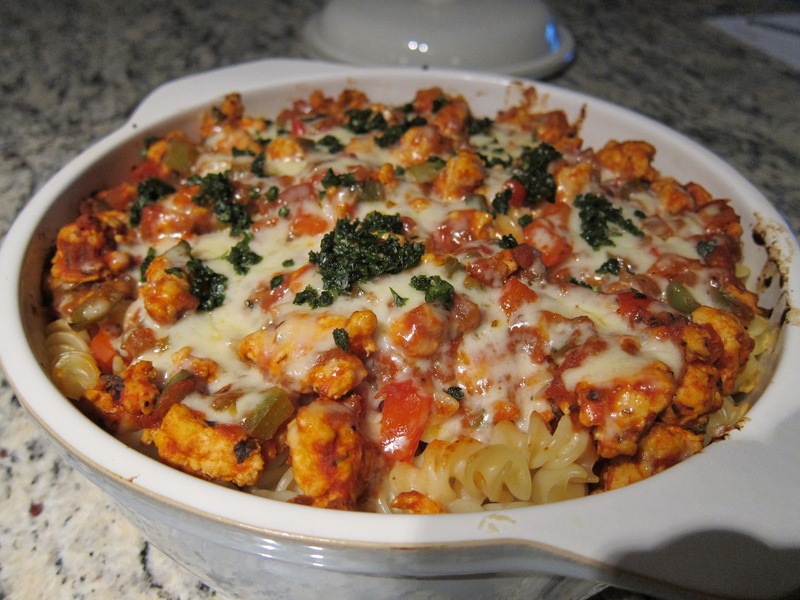 After a couple of hours of fumbling around the kitchen, I ended up with a delicious casserole of spicy and savoury pasta. Success!! More encouraging is the fact that I have a ton of leftovers which should help me make it through the week. I might have to try this cooking thing again sometime. Last week I managed to stay focussed on Carnival and pick-up some white thread from the fabric store to get 'er done. 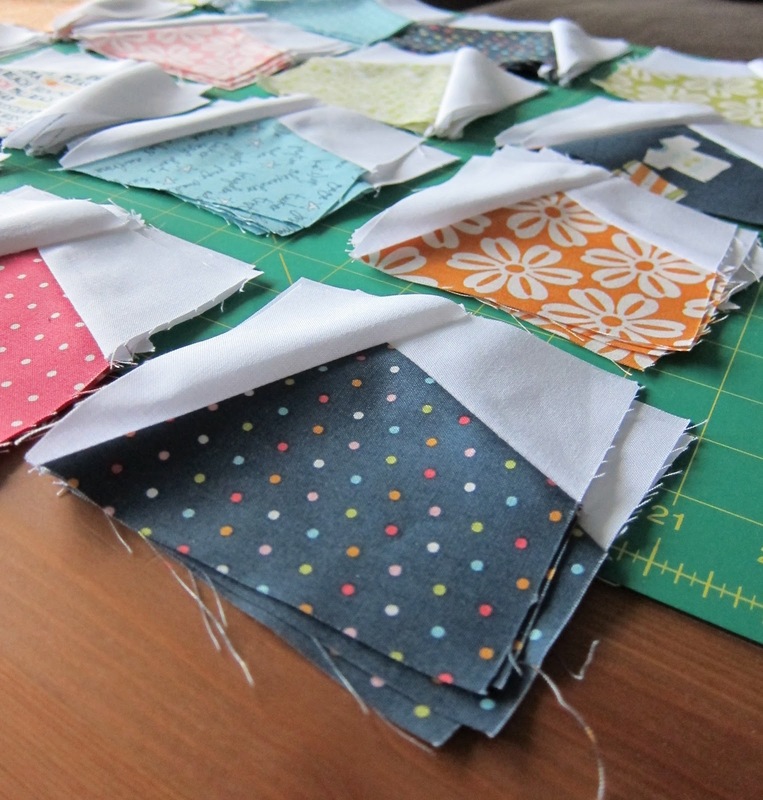 Over the weekend, I got all of my individual blocks finished and now I just need to assemble them into larger blocks, sew them together to make the quilt top and attach the borders. What can I say, it's been pretty smooth sailing. Julie's pattern is extremely well-written, clear and has lots of colour illustrations. 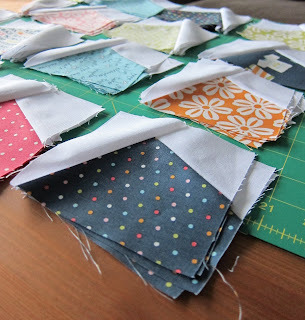 The blocks all have bias seams in them so I would strongly recommend using a walking foot to piece everything together and to be very careful when pressing (ie. use a dry iron, lots of finger pressing, and pressing as opposed to dragging the iron across the pieces) in order to avoid misshapen blocks. Those who know me know that I love having as many options as possible for as long as possible. 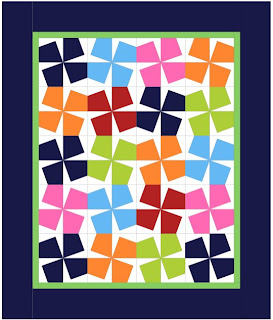 This pattern was a challenge for me in that since the blocks alternately lean left and right, that you effectively have to decide on your layout before you even start cutting. Eeek! 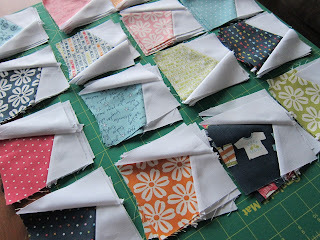 I am anxious to see how the layout I chose up-front will work for me in the end. It's always so hard to be pushed out of one's comfort zone. This is the layout I put together originally using TouchDraw. 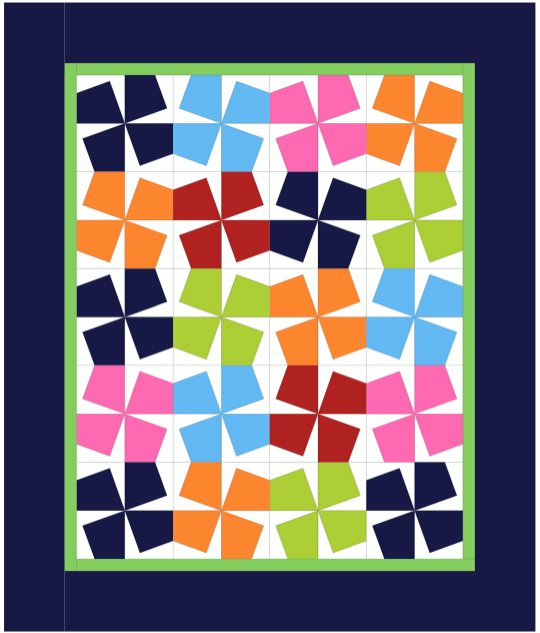 I don't think I'm going to end up sticking with it (I've definitely changed some of my blocks around) but I thought I would show you how I started planning this quilt. The only other glitch was a personal beef the Lazy Angle Ruler. I love Creative Grids' rulers. 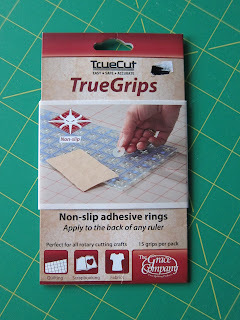 I find the markings are easy to read and the "gripper dots" are very good at keeping things where you want them while you cut. 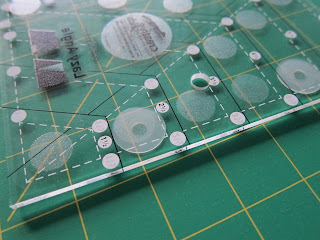 That said, the Lazy Angle Ruler requires you to flip the ruler over to cut some of the pieces. There are even measurements printed on the wrong side of the ruler to facilitate this. Unfortunately, the Lazy Angle Ruler is slick and smooth on the non gripper dot side of the ruler. Putting this slippery side of the ruler on fabric to make a precision cut is like trying to use a dull knife to slice a tomato a.k.a. a frustrating mess. 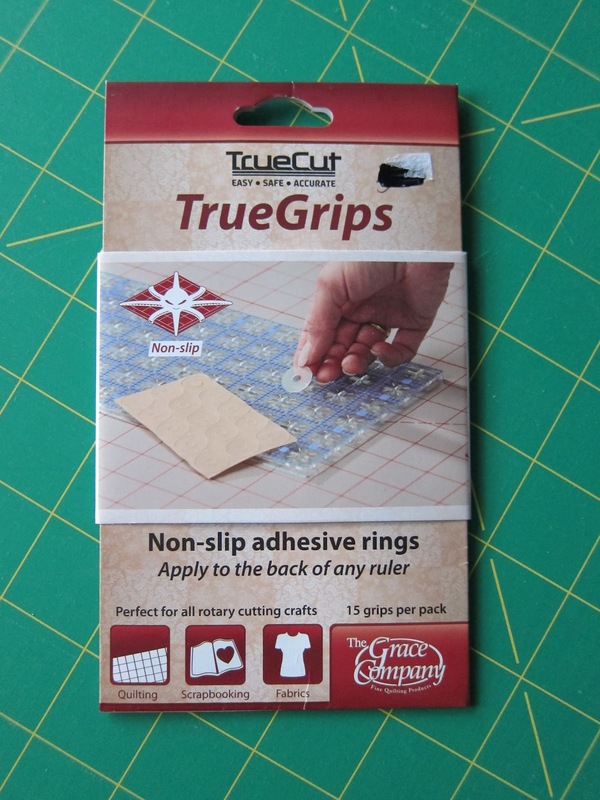 While I was at the fabric store buying thread, I stumbled across some adhesive gripper dots that you can attach to a ruler to make it slip less (didn't even know there were such things). The dots were a big help in managing the slippage situation but unfortunately were thick enough that they made the ruler float above the fabric and prevented the blade (a brand new one) from cutting smoothly in a single pass. After a few minor adjustments in my ruler holding technique, I was able to get everything to work perfectly. Gotta love the gripper dots! 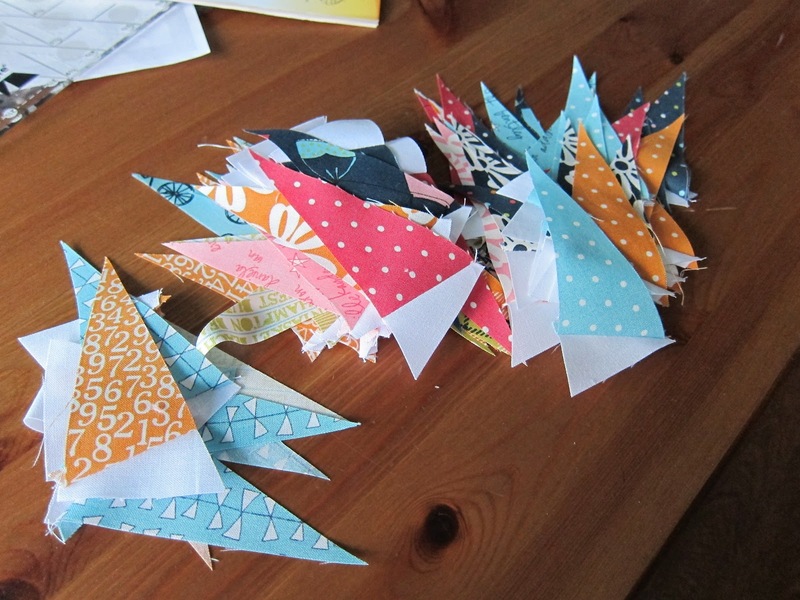 I can't bring myself to throw these "sail boat" scraps generated from making the Carnival blocks in the garbage. 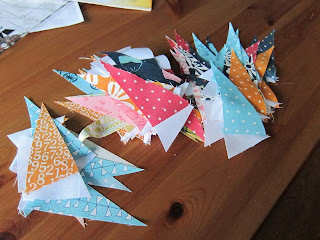 Any thoughts on what a girl might do with 80 of these?